Thomas Edison made Henry Ford believe in himself and got a friend for life! HomeWisdomThomas Edison made Henry Ford believe in himself and got a friend for life! In 1896, Thomas Edison, the great inventor who invented the electric bulb, was working on an idea to design the car when he heard that a young man who worked in his company had created the experimental car. Edison met the young man at his company’s party in New York and interviewed him about the car. He was impressed! He had the same idea as the young man but he was considering electricity as the power source while the young man used a gasoline engine to power the car. With these words of encouragement from the most highly respected inventor in the United States at that time, HENRY Ford continued his work, invented the car and became wealthy. On December 9, 1914, Thomas Edison’s laboratory and factory got burnt. He was 67years old and the damage was too extensive for insurance cover. 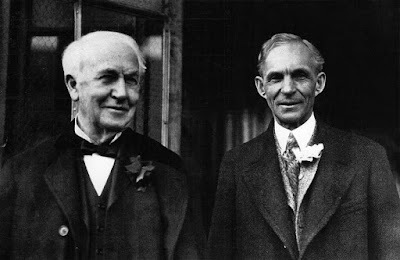 Before the ashes were cold, Henry Ford handed Edison a cheque of $750,000 with a note saying that Edison could have more if he needed it! In 1916, Henry Ford relocated his home to the building next to Edison’s home and when Edison couldn’t walk and be confined to a wheelchair by his doctors, Henry Ford also bought himself a wheelchair so that he could run wheelchair races with his friend and mentor! Don’t ever be jealous of other people’s success. If you can’t win a race, help the person in front of you break the record! Putting out the candlelight of your neighbour in the dark will never increase the brightness of yours. Your candle will not lose its light when it lights up another candle. Getting the job done is more important than who gets the glory! Be inspired, speak positively into someone’s life today, and possibly save a soul.